Unique 17C character cottage, quiet village close to pubs, RSPB, Duxford IWM. We have 2 self catering cottages next to each other. This listing is for the 2 bedroom cottage. The neighbouring cottage has 3 bedrooms. 1 Selby Cottage is a beautiful 17C cottage ideally situated along a country lane in the heart of the pretty South Cambridgeshire village of Fowlmere. With the large 5 star Chequers, pub, and excellent Sachins indian restaurant under 200m walk away and another small pub in walking distance you can choose whether to eat in using the extremely well equipped kitchen or, to have a relaxing evening meal out. Presented as a "home away from home," with every possible extra from handmade black out lined curtains and comfortable beds to DVD's, toys, kitchen extras and toiletries to ensure you have the most relaxing stay. The pretty village location is hard to beat for exploring the area. With Cambridge's top tourist attraction, Duxford Imperial War Museum an easy 10 minute drive away, Shepreth Wildlife park is in the adjacent village and Wimpole Hall Estate the largest Stately home in Cambridgeshire only 20 minutes drive away. Cambridge can be reached within 25 minutes and London is under an hour away by train. Downstairs the kitchen has seating for 6, microwave, dishwasher, double oven with hob and grill, family fridge freezer, coffee machine and washer drier. The lounge has a high quality italian leather 4 seater sofa and matching chair, small desk, flat screen tv with integrated DVD player. DVD library and Now TV box. Upstairs there is a modern white bathroom with shower over the bath adjacent to the twin bedroom. The master bedroom is unique with the exposed fire breast from the Inglenook fireplace and plenty of hand made furniture. Outside there is a patio table and chairs and parking for one car. They pretty village of Fowlmere is steeped in history. Tucked away behind the 12C (in parts) St Marys Church and the village green is the Round Moat, thought to be the site of a Castle in medieval times. Today it is mostly overgrown woodland but, also a local treasure. Fowlmere airfield was instrumental during both the first and second world wars and the place where the RAF and USAAF were based and flew their Mustangs and Spitfires. There is a lovely village walk that encompasses the Moat, airfield war memorial, Fowlmere RSPB and loops back to the cottage. After sight seeing you may fancy a pamper and there is a wonderful Beautician and Hairdressers in the village for the ladies. I live with my Husband Paul (an aviation enthusiast since he as a child, who also has his Private Pilots Licence) two teenage sons and our dog, Scrumpy. Prior to having children I lived in London and worked internationally in IT. I have lived in the village for 10 time fly. I go to the gym most days and enjoy walking, history, cooking and I am currently writing a series of children's books about frogs. Perhaps one day you can say you stayed in that famous authors house....I can only dream! Paul owned the 3 bedroom cottage next door before I was married to him and when I saw the 2 bedroom cottage I said to the Owners "If you ever want to move let me know as I absolutely loved the place". It's unique and quirky and when I lived in London I always wanted a country retreat about an hour away. I loved the idea of being able to relax in total silence at the weekend and just get woken by the birds. Nothing quite beats reading a book on an evening in front of a roaring fire on a winters night With the excellent pubs and Indian just around the corner and Cambridge on our doorstep the cottage ticked all my boxes and more. I ended up marrying the man next door earlier this year (2017) so, lots of dreams come true. This cottage has a wonderful light and airy feel about it. I love watching our Guest's reactions when they arrive as it is just totally unique and often described as a bit of a gem. The quiet location in the heart of the village, the Hobbit sized front door, the beautiful beamed walls and ceilings, the fireplace in the lounge the exposed fire breast in the main bedroom and even the small doorway between the bedrooms are all part of this cottage's unique charm. But, the thing I love most is the feel of the place when the sun streams through the kitchen windows or, you are met by one of the two horses who live in the lane clip clopping by, I always smile and think it is pretty much perfect. Now TV box is available for you to log into your account and watch Sky movies. 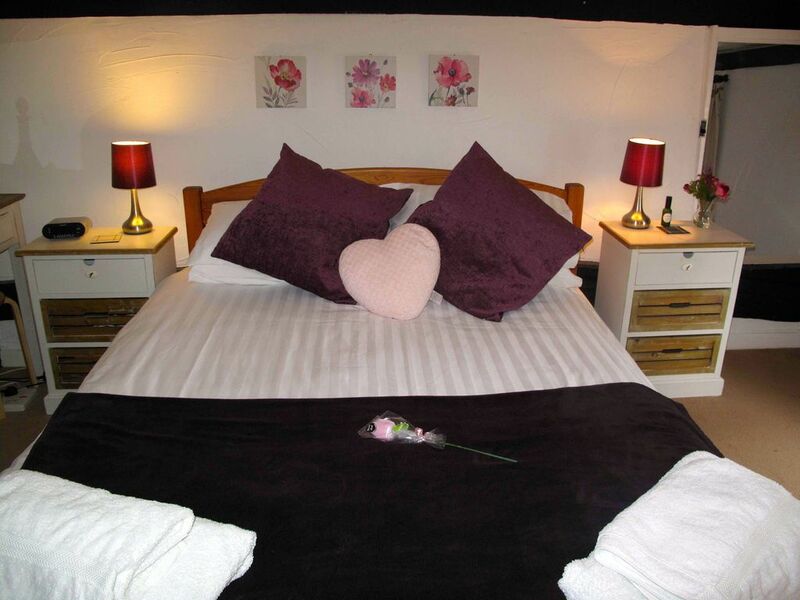 Thank you so much for taking the time to review the cottage Alix. I am pleased you both had a relaxing stay away from the hustle of your daily lives in London and that you were able to get into Cambridge easily to see your Client by train. It was an absolute pleasure to meet you both and learn a little about your daily lives whilst sitting at the patio table with you in "the little sun trap" as you rightly called it. Hope to see you again. We thoroughly enjoyed our stay here, the cottage is very homely with everything you need away from home and we loved its quirky layout, my daughter in particular loved the little door adjoining the two bedrooms and the two sets of stairs that meant you can do a circular route around the house! It’s in a lovely quiet little village but within about 20 minutes of Cambridge and 1 hour train into London. Janice was a very friendly and helpful host, even leaving us a tailored welcome pack with wipes and baby food for our 6month old and a colouring book for our 5 year old, the extra thought made us feel very welcome. We would definitely recommend the house and would stay here again if we were ever back in the area. What a lovely review to wake up to this morning. Really pleased you all enjoyed the character of the cottage and how close it is to London. We try very hard to make sure our Guest's have everything they need when they arrive and it is wonderful to get a review to let us know the extra thought with regards to the children is appreciated. We look forward to seeing you again when you are next in the area and a special thank for leaving the cottage so tidy when you left it is always a big help in terms of changeover. We spent a lovely week at 1 Selby Cottages. Janice was the best host - very ameniable and helpful. It's a quirky cottage with steps and different levels, probably not best suited to anyone infirm but we were only two and it suited us perfectly. The local pub, The Chequers is great for a meal, as was The Red Cow at Crishall. Getting out and about is easy too. Just a short ride into Cambridge - the Park and Ride facility is close and a lot cheaper than parking in Cambridge itself. Lovely local walks - Janice can tell you the best ones. Bury Farm shop is a great place to shop - lots of lovely stuff to choose from. Thank you so much for taking the time to review our quirky cottage. I found out after you left. that the cottage was originally the village bakery in the 1600's! Really pleased you found the cottage a good base for exploring the Cambridgeshire area and local walks, shops and pubs. We would love to have you back as our Guest's if you are ever back in the area. Thank you for taking the time to review out character cottage. I am glad you enjoyed our pretty village and found the cottage had everything you needed for your stay. Thank you so much for taking the time to write a review. So pleased your family enjoyed their stay and that the Welcome Pack made things easier for you all on arrival. Hope everything is going well with your house renovations. The cottage is all that you would expect from a 17th century building. The hosts were very helpful and the welcome pack was a big plus. All the amenities were were there. The area surrounding the pretty village of Fowlmere is surrounded by quintessential English villages. Cambridge, Grantchester, Saffron Walden and Royston are all easily reached within 20 minutes drive and even London can be reached in under an hour. Offering Museums, Punting, Kings College, Cambridge Botanical Gardens, tearooms, pubs and historic buildings are plentiful. Fowlmere itself has a very pretty RSPB Nature Reserve, an Ancient landmark of woodland known as the Moat is tucked behind the village green. A tiny farm airport that was once large hangers and instrumental during WWI & WWII with both British and American Pilots. The 3 village pubs are all steeped in History particularly The Chequers. Nearby Duxford Imperial War Museum is often considered the top attraction in Cambridge and is reached easily with a 10 minute drive a must for anyone interested in Aviation. Cyclists and walkers are seen daily going through the village. A one mile walk away is Thriplow Village with the Thriplow Daffodil weekend drawing 10,000 people each year. Wimpole Hall,( National Trust) is the largest stately home in the country and Audley End House (English Heritage) is often considered the one of the finest Country homes in England both are approximately 20 mins drive. Golfers will find the both Gog Magog golf courses and Saffron Walden Golf Course within 20 mins drive, and Heydon Grange is at the edge of the village and the Kingsway Golf Center is in neighouring Melbourn with its 40 bay driving range and golf shop. Children are very welcome and Shepreth Wildlife Park is a 5 minute drive away, Bury Lane Play Barn and the award winning Linton Zoo are also great for days out with the children. In the summer months Bury Lane offers stawberry picking, In the Autumn Harston has a lovely orchard for apple picking and Milton Country Park is full of blackberries. The cottage has small doorways, beamed ceilings and windy steep staircases so, it is not suitable for people who are less able. Stair gates don't fit.